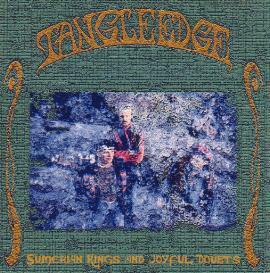 Tangle Edge - "Sumerian Kings & Joyful Doubts"
This writer has always argued the premise that so-called "Progressive Rock" was always part of an international musical language rather than just a creation of the instrumental elites of British rock, and I have always been able to identify a varied group of artists from all over the globe to give credence to my position. Like Absolute Zero, French TV, the Muffins (USA), Acid Mothers Temple (Japan), Violeta D'Outono (Brazil), Zuki Zev (Azania), Cast (Mexico), Claus Bolling's Elektrum (Denmark), Tangle Edge represent a Scandinavian take on the international language of this music. Their approach is both minimal and heavily chromatic, and involves an almost telepathic communication between Guitarist Ronald Nygard and BassGuitarist Hasse Horrigmoe. They execute odd-meter riffs and licks without any difficulties, and keep up the energy in all the jams. The task of keeping the rhythmic pulse is executed with a great amount of skill by Drummer Kjell Olif Johansen, who has been with the band since 1988. A look at TE's website reveals a long history as Norway's leading Progressive unit! Since 1982 they have created music rooted in the tradition of the music, but with a distinct usage and understanding of both the folk traditions of their country, and a basic grounding in Blues forms and structures. This release was recorded live on 2 track DAT at a variety of gigs in Norway and Denmark during 1993 & 1994 and displays how their musical thoughts are expressed in concert, from both a compositional and improvisational perspective. Nygard is an excellent Guitarist, handling many of the melodic parts with ideas generated from an experience which involved studying a wide variety of the world's music, while Harrigmoe lays down solid, challenging Basslines as well as adding melodic flourishes to some mighty fine drumming. The tightness of the ensemble is something came by only through hard work on the music, and the respect these musicians display for each other results in a polyrhythmic stew in which each instrument contributes both flavor and substance to a great musical meal! "The Glorious No Doubt Trilogy" opens up with Guitar, then Bass & Drums enter with ever-thickening Harmonic counterpoints that seem to explode in the listener's ear and reveal secrets as the band jams and stretches the boundaries of the composition, as themes rise and resolve themselves in unexpected directions. The themes unfold and progress over odd-meter riffs carried admirably by the rhythm section, who are completely comfortable with the shifting time signatures, handling the complex timings with ease. "Sumerian Kings" is a familiar piece to anyone who has heard any of the series of live tapes the band has circulated amongst their world-wide community of fans. Drummer Johanson is really impressive on this cut, laying down a barrage of rhythm in support of BassGuitar, whilst Nygard's Guitar sounds run a gamut of voices and sounds, from Robert Fripp-like tones to Jimi Hendrix overtones to Derek Bailey-type atonality! This is a grouping of musicians with sticking power, having been involved with playing the music since the early 1980s and developing a well deserved international following. This CD will do much to further their already fine reputation as one of the movements leading bands! For more information you can visit the Tangle Edge web site at: http://www.tangleedge.com.